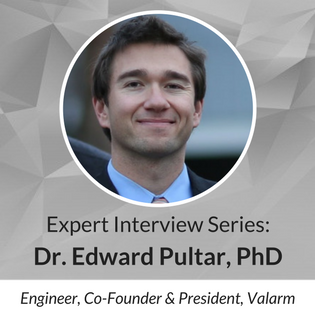 Dr. Edward Pultar, PhD, is an engineer and founder at Tools.Valarm.net, an Industrial Internet of Things / IIoT company that monitors environmental assets like air quality, pollution and water. Tools.Valarm.net also gives organizations real-time monitoring of any industrial equipment and assets. Valarm Tools Cloud software makes effective business information available for decision makers in all industries, so they can create profit and efficiency for their organizations. Can you tell us about the mission behind Valarm? How are you hoping to impact industrial technology? The mission of Tools.Valarm.net is to help organization’s around the world with effective remote monitoring systems. Our motto is monitor anything, anywhere, and we really mean it. Tools.Valarm.net software impacts industrial technology by giving you rapidly deployable sensor telemetry solutions. The company started after my brother Lorenzo’s motorcycle was stolen. Years ago we made the Valarm Tools Cloud platform for monitoring assets, like stolen motorcycles, and quickly realized the utility for all industry verticals. From distant facilities, tanks,and water wells, to fleet vehicles and mobile assets monitoring air quality and industrial equipment, our software continues to be improved as we listen intently to the needs of our customers. Can you talk about the world of the Industrial IoT? How has it evolved in recent years? What are your predictions for the future of how IoT is applied to industry? Industrial IoT is a rapidly growing world. In recent years we’ve seen a significant increase in customers monitoring two key factors: air quality and water / fluids. There was a gap in industry for remote environmental monitoring, particularly air and water, and I believe that will continue to be an area of growth for the future. I believe in the future we’ll continue to see new networking technologies, like LoRa, Sigfox and Ingenu, that are focused on connecting Internet of Things sensor devices to the clouds. Also, I think that international sensor standards will be even more critical in the coming years. Technologies like 4-20mA, 0-10V, serial, RS-232, RS-485 Modbus, and SPI allow sensor adapters to communicate and read sensor measurements regardless of where the sensor was manufactured. What are the advantages of using remote monitoring? What about any potential drawbacks or risks? Remote monitoring has many advantages. However, just like everything else it’s not perfect, so there are pros and cons for your organization. A key advantage with remote monitoring is saving time and money. Many organizations have folks drive for hours out to remote field sites to take a measurement from a sensor, then drive a few hours back to the office. One example of this is with water resources management and remotely monitoring water wells. Staff used to drive to a distant water well and write down water usage measurements (e.g., gallons, inch acres, or liters) from flow meters and water level measurements from pressure transducers. Industrial Internet of Things and IoT sensors give organizations these measurements automatically on a webpage or a custom dashboard. By eliminating hours of driving, employees spend more time analyzing sensor information and a business has less gas expenses plus less wear and tear on their assets like vehicles. A potential drawback is the risk of vandalism and damage to remote monitoring equipment. By locking or deploying monitoring systems in high or difficult to access locations helps reduce this risk. What have been the most interesting or exciting applications for remote monitoring products you’ve observed? The most exciting applications for me are water and air quality monitoring systems. Air and water are valuable assets for you, me and everyone on our planet. How long can you and your family live without water or air? I feel grateful to make an impact with businesses, environmental consultancies, government agencies, cities, and organizations to monitor pollution, particulate matter like PM2.5, gases (ozone, sulfur dioxide, nitrous oxides) and water resources. What tools do you rely on to build and run your products? What is essential to ensuring your clients are collecting accurate data efficiently? We rely on excellent sensors made by companies all around the world. For efficient data collection, it’s essential to use the most effective combination of hardware equipment, which may come from all over the world, like California, Colorado, England, Switzerland, Texas and New York. Today our customers also rely on Tools.Valarm.net APIs to integrate their remotely monitored sensors with their business intelligence and analytics systems, products, and tools like the Esri ArcGIS platform and Cityworks. What are best practices for implementing a remote monitoring strategy? What considerations should company’s be making? In my opinion best practices are to make sure you’re considering what options will make your remote monitoring deployments the most effective. For example, I recommend using most effective internet connectivity for your application. Since Tools.Valarm.net is an open platform, you can send and upload your sensor measurements using any connectivity, whether it’s GSM cell networks like 3G, or WiFi or ethernet. Our customers who monitor stationary assets and tank farms save money every month by using their existing WiFi and ethernet networks to upload their sensor information. While they could upload tank level and volume measurements via mobile cell networks, that would cost more than using the internet connection already available at the office! We recommend a similar implementation practice with power sources. Sometimes a solar powered remote monitoring system is appropriate in distant facilities. However, even with remote water wells, there is a water pump, so that means there’s a standard power source available like standard mains wall electricity 110V AC. Why not use that? A one size fits all IoT solution doesn’t make sense because each organization’s remote monitoring needs are unique. If there is a power plug available, use it! You’ll save money by not buying solar panels, batteries, solar charge controllers, and other equipment. The simplest solution makes the most sense. Keep it simple. How can industries use the information they’ve collected over time to improve the efficiency and effectiveness of their equipment and processes? Efficiency and effectiveness are critical for our customers monitoring fleet vehicles, trucks and trailers with industrial assets like pumps, vacuums, motors, generators and tanks. Over time, organizations in industries like chemical distribution use Industrial IoT and remote sensor monitoring to fulfill Supplier Managed Inventory (SMI) needs. This means if a tanker truck is returning to headquarters, but is passing by a customer who is low on fertilizers or oil in their tanks, then this connection can be made and the truck can make a quick stop to refill product right now rather than driving back out in a few days. Another application is monitoring run times of industrial equipment and assets like pumps, generators and motors. Run time counters keep track of how long an asset has been turned on and how long it’s been turned off. So you’ll be alerted and know if your equipment has been running for a critical number of hours in the last month and it’s now time to run the recommended cleaning or maintenance routine. Learn more about how you can manage your assets and IT using the Cloud.